We all point fingers at others; especially our leaders, politicians, celebrities and the rich, complaining about how they are selfish, greedy and that they don’t care about the well being of the planet. However, at the same time, whether you like to admit it or not, most of us are hypocrites because we also spend most of our time trying to benefit ourselves. At the end of the day, our earthly nature makes us put our needs and desires first and sadly this makes us forget about our own obligations towards our planet. So with that said, I would like to share with you 5 easy ways that each one of us can follow to help preserve our amazing planet. This one is especially important for those living in the West world where most amenities are taken for granted. Water is one of those amenities that is being wasted so increasingly and needlessly. Soon enough,when water crisis becomes a reality all over the globe, we will realize that we shouldn’t have wasted so much of it so needlessly. According to Canadian Geographic, 35% of residential indoor water use in Canada comes from bathing and showering! This is a staggering number and with just a little consideration we can all help decrease this amount and help decrease our negative impact on our planet. You don’t need to take a shower every day, and when you do be quick with it. No need to turn your bathroom into a sauna just so you can feel a bit more relaxed. Remember we are here on earth for a greater purpose than simply to fulfill our temporary temptations so think of our planet the next time you take a quick shower and you will feel better simply because you are helping our planet. 2. Try to flush your toilet less often. 30% of residential indoor water use in Canada comes from using the toilet! This is the 2nd largest water consumption method after shower and bath use. It is important to be conscious of our actions and this is one way that our awareness can help on a grander scale. When you wipe your nose after sneezing and you throw that tissue into your toilet, don’t flush! If you spit into your toilet, don’t flush! If you throw leftover soup into your toilet, don’t flush! If you are the only one who uses a toilet in your room, there is no need to flush every time you urinate either. Try to flush every 2nd urination and this will drastically decrease your water consumption, it will decrease your hydro bill and it will help preserve our planet. 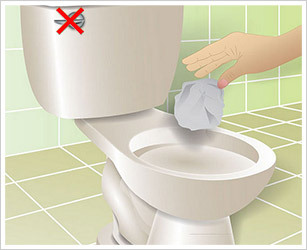 Simply get used to putting the toilet cap down after using the toilet and this will eliminate any smells. 3. When washing dishes use less water. This may seem like a no brainer but if we are not aware of the impact our water consumption has on the planet, we cannot make a positive difference. So, when you wash dishes be aware of the water being used and try to minimize it. 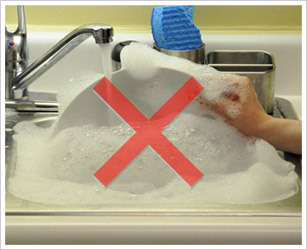 One way to do this is to first rinse the dishes with water to remove any food or dirt and then shut off the water as you are scrubbing the dishes with soap. You don’t need water during this stage, and you may not be aware but a lot of water is running needlessly while you are doing this. Once all dishes are soaped up, quickly rinse them. This will save you time and it will eliminate germs even better because the soap will have more time to soak in without the water washing it off. Before you know it, this habit will translate into large amounts of water beings saved up and your negative impact on our fragile planet will decrease day by day. 4. Shut of the lights! Some of us were fortunate enough to experience our parents screaming at us when we were younger to shut of the lights when it is bright out, or when we leave a room or our home. I was one of those fortunate people, but many of my friends were not. It simply does not cross their mind to shut of the lights. If you rent a place where electricity is included in your monthly bill and if you don’t pay more or less depending on your electricity use, this is not an excuse to waste needless electricity. We all have an obligation to help our planet and this is a very easy method to do so. 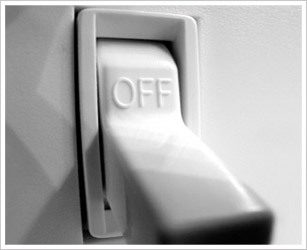 Get used to shutting off the lights when you don’t need them and it will soon become a habit that you don’t have to think of. You should also do this when you go to your friends house and spread the word. Don’t be shy or worried that someone will think you are cheap. What matters is that what you are doing is right, and when you know your efforts are helping the world, you will feel right as well. No doubt, it is convenient to have a single garbage bin and throw everything in it. However, this has many negative effects on our environment. Not only are you making the job of the garbage facilitators harder but you are creating more pollution for our planet to deal with. Landfills are an increasingly pressing problem. Less and less land is available to deposit waste, while waste volume is increasing rapidly. So take the time to replace your single garbage bin system with at least 2 different bins. 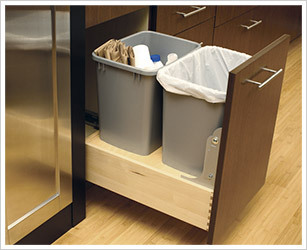 The best way is to have separate bins in your kitchen where most of your garbage is disposed of. One bin should be only for your recyclable waste (paper, cardboard, plastic, glass, scrap metal, etc.). The other bin should be for your compost: decayed organic material used as a plant fertilizer. Ideally you should place all your compost into a single bin and let it decompose in there over the year and then use it as fertilizer for your soil in your home garden. If you don’t have a garden, keeping compost separate from recyclable waste makes it easier for waste management companies to deal with it and helps our landfills decrease the negative impact they have on our planet.